As copywriters and content creators, all we do is write. A lot of the content generated is made with grounds in research and densely-detailed briefs, however, it is compiled into words and sent out into the Internet to be broadcasted on any of the multitude of social media pages and publishing platforms. What if we told you that our job could get ten times easier thanks to AI? Sounds reasonable, considering the fact that in current times that is the general trajectory of things. The age of technology is here to stay, as we are at the doorstep of the fourth Industrial Revolution, which is taking place with a framework of innovation and growth that have become automated. The constancy at which we are revolutionising technology has become integral to remodelling the frameworks we are working within. AI-generated content is slowly being introduced to the journalistic world, with most notably The Washington Post relying on articles written by Heliograf, the newspaper’s AI technology, stating that, “You choose the topic and length and our algorithm will create your content.” Heliograf’s articles are more on the straightforward side, with topics ranging from sports and the Olympics, to politics. Once Heliograf generates a piece, it is reviewed by an editor for those Google Translates awkwardly worded but technically correct phrases. Following the human touch, it is a perfectly readable and thorough article. Our technologies are able to generate plausible and valid articles in less than half of the time it takes us; so what’s the catch? AI is not only a generator, but it is also a researcher and a marketer. The gap of content that is discovered and in turn used is narrow due to the high-speed search engines that feed the algorithm. AI knows who to target, and how, ensuring that the appropriate audience discovers appropriate pieces, and actually engages with them. It knows how to create content that is dense, and produced fast enough to be a valuable source of real-time data. It has the conversational skills down to the tee, even at early stages of the conversation. The disadvantage of AI-powered conversations is that, without the human touch, there is a dissonance between it and content that is highly emotional. Although powered by humans, it lacks the characteristic empathy that fuels so many of our decisions. It lacks the ability to hold a subjective and case-by-case debate, as it is a fact-based system. There is also the question of false news, something critics are very skeptical of when it comes to AI-written pieces. And with reason, as the age of propaganda and questionable facts is at an all-time high with social media and the Internet’s fast-paced spread of information. With the digital era ablaze, we are quick to mistake what technology should be classified as. Its role is not to replace our efforts, but to complement them. 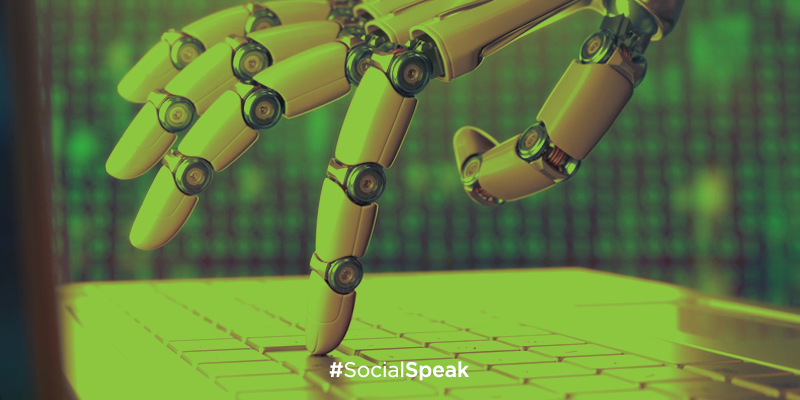 That’s enough food for thought this week, make sure to visit our blog next week for your weekly dose of #SocialSpeak. #SocialSpeak: Should You Worry About Your Data Privacy on Facebook?